When developing a new catamaran vessel that was already pushing the boundaries in design, it was imperative that the engines chosen to power the vessel were of the highest in quality and performance. Stuart Ballantyne, CEO of Sea Transport Solutions – the designers of the SWATH catamaran ‘Passion’, was extremely specific in the capabilities of the chosen engines that would be used in the vessel and after a lot of research, decided on Yanmar. Designed and manufactured in Japan, Yanmar Co. Ltd was founded over 105 years ago with their success in producing reliable and quality products such as heavy equipment, watercraft, diesel engines and unmanned aerial vehicles. 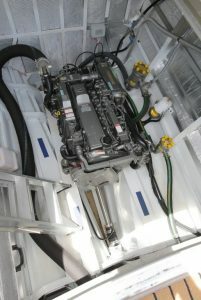 The Yanmar engines that were inserted into vessel were the 6LPA-STP2 and provided the required performance and preferred fuel consumption for the 17 metre catamaran that was designed on the Gold Coast at STS. With the Yanmar engines ticking over at 2800rpm with the impressive fuel consumption of 22.5 litres per engine per hour at the comfortable cruise speed of 18 knots 22.5 litres, the engines can travel 23.5 knots with no compromise to performance.